Typical Ballarat clothing in the early 1850s – note the long leather boots. Eugène von Guérard, Blackhill 21 Febrav [February] 1854, Reproduced with permission from the State Library of Victoria. Gold Museum Curator, Snjez Cosic, modelling a fine example of 1850s fashion made recently by the Sovereign Hill Costume Department. Reproduced with permission from Jade Smithard, Mojo Photography. It didn’t take long, however, for the wealth from gold to start attracting women and families to the diggings. As living conditions improved and permanent houses were built by the mid-1850s, the trendiest fashions from England, France and the USA began to grace the (still rather muddy) streets. It was no wonder – Ballarat had become one of the richest places in the world by this time, and the fashions sported by residents reflected this new wealth. While crinolines and corsets, top hats and bling were all the rage, these flashy fashions, much like many today, were about communicating your social class (or status) in society – meaning they showed others how important you were. While the poor (and there were plenty of people at this time who weren’t reaping the rewards of the gold rushes) wore whatever clothing they could patch together, the rich were enjoying fancy fabrics, new dye colours thanks to the Industrial Revolution, and expensive accessories. Fashion brand names weren’t really invented yet, so instead of showing off your money by displaying an expensive brand across your chest like many people do today, you paraded around in lace, silk ribbons, tall hats and elaborate gold jewellery to show off. It will be no surprise that large pieces of gold jewellery were all the rage in Ballarat in the 1850s. Brooches made of Ballarat gold. Reproduced with permission from the Gold Museum. At this time in history, cotton fabric was quite cheap to buy for sewing into dresses and shirts, because the plants that produce it were mostly being planted and harvested by African slaves in the USA. As cotton plantation (farm) owners didn’t pay their workers, this very cheap material was transported all over the world and was affordable to everyone; it was turning it from cloth to clothing that cost a lot of money (paid to a tailor/seamstress) or time (for the hardworking housewife). Poorer women made their own clothes by hand (until the sewing machine became widely accessible in Australia in the early 1860s), while wealthy women had their clothes tailor-made. An example of a crinoline created by the Sovereign Hill Costume Department. Underneath you can see the model’s pantalettes (undies!) and chemise (like a long singlet). It might surprise you to learn that few people owned wardrobes until recent times, as even the cheapest clothing was still very expensive by today’s standards, which meant that during the gold rush each person only owned a couple of outfits. Clothes are so cheap today in comparison that Australians buy 27kg of new clothes on average per year, making us the second largest consumer of textiles in the world! Interestingly, the bell-shaped crinoline underskirt which is probably the most well-known fashion of the mid-1800s was viewed by many women of the time as a liberating garment because they could walk more easily than beforehand when they had worn many layers of skirts to make the same shape. While some cartoonists saw the funny side of crinolines which many called ‘crinoline mania’, wearing one could be dangerous as they caught fire easily. Corsets were dangerous, too, when worn very tight – most women wore them like bras are worn today, while the rich and fashion-conscious sometimes wore them so tight they broke ribs and moved vital organs. The Victorian dress reform movement saw women encouraging other women to give up dangerous and uncomfortable clothing from the 1850s onwards, and this was thought by many to represent the first wave of feminism. ‘A Splendid Spread’, a cartoon about crinolines by George Cruikshank, from The Comic Almanack, 1850. Reproduced with permission from Wikipedia Commons. For men who had already found their fortunes on the goldfields, the wearing of white shirts, tall top hats and swinging about a fancy cane showed off their status, along with sporting beautiful fob or pocket watches. If your great-grandfather handed down his watch through your family, it is likely it was his most valuable and treasured possession, although by the late 1800s they became much cheaper thanks to the Industrial Revolution. This is a goldrush sketch of a Wadawurrung girl from Ballarat wearing a warm possum-skin cloak – the pelts of brushtail possums are warmer than wool and are waterproof. William Strutt, Waran-drenin, 1852. Reproduced with permission from the British Museum. Australian-specific clothing became available from the 1850s onwards due to the special furs of our native animals. Warm brushtail possum pelts (the fur with the skin [leather] still attached) sewn together and turned into rugs which were supplied by local Aboriginal people, were useful for keeping miners alive during a Ballarat winter in a tent. As platypus pelts were fashioned into expensive jackets and rugs for the wealthy, it’s no wonder that platypus are so rarely seen in the wild these days. The Sovereign Hill Museums Association has many pieces of clothing and jewellery in our collection of artefacts from the 1800s; however, they are mostly the fanciest items that people treasured, rather than everyday items. That’s why Eliza Perrin’s dress is a particularly special piece in our collection – watch a video about it in Chapter 6 of our ABC Education ‘digibook’ here. You can also learn about the popularisation of white wedding dresses here, fashionable 1850s hair dos here, how the Sovereign Hill Costume Department researches and makes our 1850s clothing here, the differences between clothing now and 19th century clothing here, and typical children’s clothing from the goldfields era here. Ruffles, ribbons, fringes and extra details on outfits showed off one’s wealth in the late 1850s. Reproduced with permission from the Gold Museum (these Ballarat women are unidentified). How does the Ballarat gold rush fit into the story of the State of Victoria? Let’s take a look at the bigger picture. 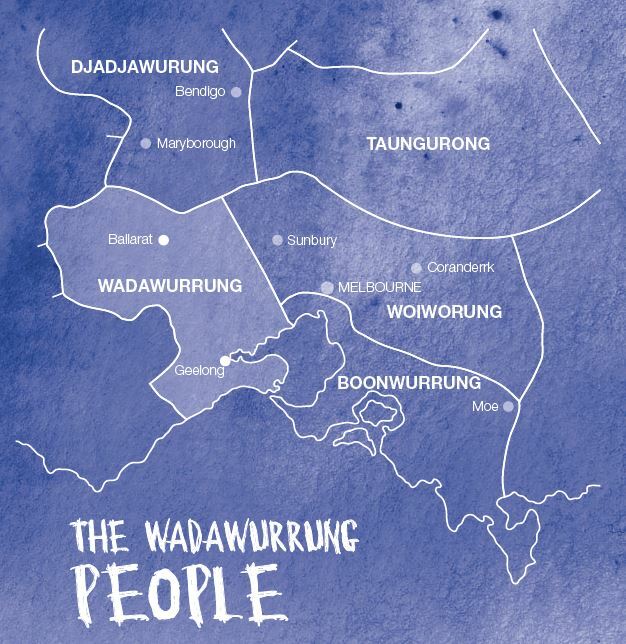 The Wadawurrung people have lived in the Ballarat region for tens of thousands of years. This map, produced by Sovereign Hill for its annual Aboriginal history and living culture celebration – The Gnarrwirring Ngitj Festival – shows the borders of the five Kulin nations. Aboriginal people began living in what is now called Victoria at least 50,000 years ago (or possibly even longer!). According to their spiritual beliefs, creator-spirits like Bunjil the wedge-tailed eagle made the land and its people, and stories about him have been passed down (without writing) for at least 2,000 generations amongst the people of the Kulin nations (the Wadawurrung, Woiwurrung [Wurundjeri], Bunurong, Taungurong, and Dja Dja Wurrung). When Europeans arrived in Victoria in the 1800s, they found the Aboriginal people of this land had formed approximately 35 nations, all with different languages and cultures. Each nation owned and cared for their Country. The boundaries of each of these nations were carefully protected; however, goods like greenstone axes and brush-tail possum pelts used for making cloaks were traded over them. While some of these Aboriginal nations are traditionally enemies, others continue practising important ceremonies together (like the Kulin nations’ Tanderrum ceremony) to this day. 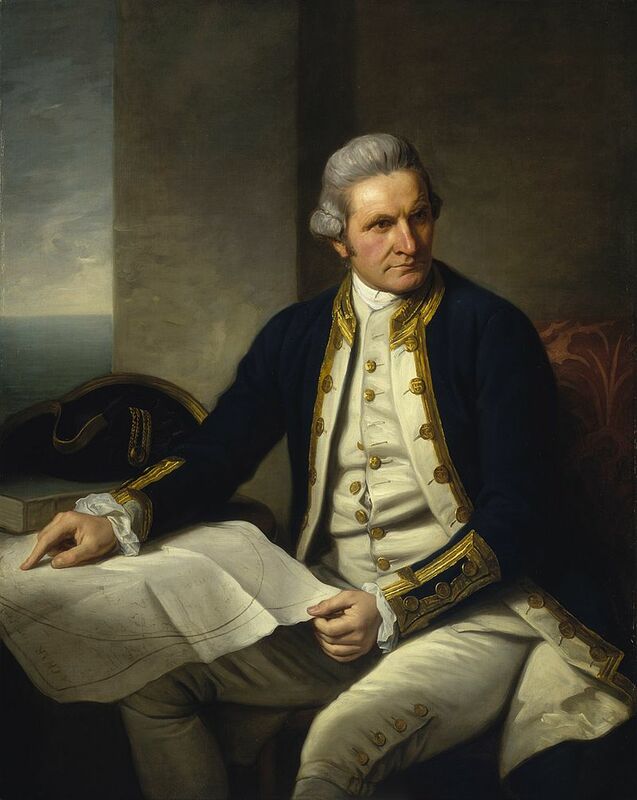 Nathaniel Dance-Holland, Official portrait of Captain James Cook, 1775-6, from the National Maritime Museum, United Kingdom. Reproduced with permission from Wikipedia Commons. When Captain Cook claimed possession of what he called ‘New South Wales’ in England’s name in August 1770, he hadn’t set foot on the coast of what is now called Victoria. After England lost its northern hemisphere penal colonies (a place to send convicts) in the American War of Independence in 1783, it was decided that New South Wales, in Australia, was the next best place to send England’s criminals. England wanted to colonise (take over ownership of) the ‘great southern continent’ before the French. So, in 1787 King George II sent Captain Arthur Phillip to New South Wales with what came to be known as the ‘First Fleet’. Phillip’s ships arrived in Botany Bay in early 1788, but decided this was an unsuitable place for a settlement, so they sailed to Sydney Cove, in Port Jackson, and sent the convicts to shore on 26 January. This fleet of English ships only beat the French ships by a few days. Before any Europeans arrived in Victoria, their contagious diseases spread out from Sydney to kill countless thousands of Aboriginal people across all of Eastern Australia. European diseases like chicken pox, small pox and even the common cold caused large numbers of Aboriginal people to die during this time in history, as their bodies had never been exposed to these germs before. Sadly, we will never know how many Aboriginal people were in Australia before Europeans arrived, and we will never know how many died from these diseases they brought. 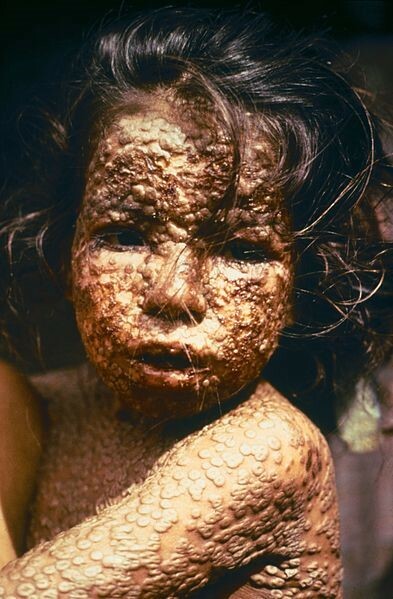 Young Bangladeshi girl suffering a smallpox infection, 1973. Reproduced with permission from the Centers for Disease Control and Prevention’s Public Health Image Library. Europeans explored the Victorian coast in the hope of developing a second Australian penal settlement and decided to send a small group of soldiers, settlers and convicts from England to set up a camp in Port Phillip Bay (of what later became Melbourne) in 1803. Again, this was an attempt to beat the French in taking over the lands of Australia. During their stay of less than 2 months, they clashed with local Aboriginal people, killing a Wadawurrung leader in Corio Bay in the process, making him the first Victorian Aboriginal person to die at the hands of the European colonisers. The camp failed as they ran out of fresh water, and a number of the convicts escaped before their ships left for Van Diemen’s Land (now called Tasmania – it changed its name in 1856) to establish the second penal settlement there. One of those convicts – William Buckley – lived with the Wadawurrung people for the next 32 years. 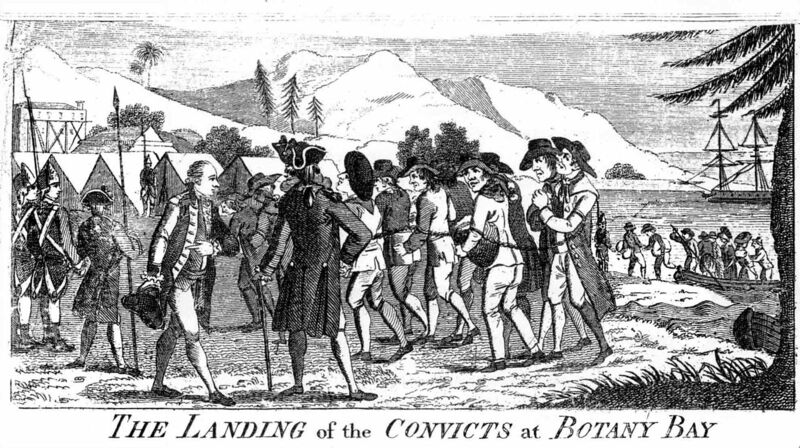 Watkin Tench, The Landing of the Convicts at Botany Bay, from his book ‘A Narrative of the Expedition to Botany Bay’. First published in 1789. Reproduced with permission from Wikipedia Commons. … the view was exceedingly beautiful over the surrounding plains. A land so inviting and still without inhabitants! As I stood, the first European intruder on the sublime solitude of these verdant plains, as yet untouched by flocks or herds I felt conscious of being the harbinger of mighty changes; and that our steps would soon be followed by the men and animals for which it seemed to have been prepared. See more Major Mitchell quotes here. When he explored as far as Portland on the same expedition, he was surprised to discover European whaling ships there, and even a farm owned by the Henty brothers. When he returned to Sydney, he also discovered that John Batman, a Sydney-born free settler (with a reputation in Van Diemen’s Land for hunting and killing Aboriginal people), had signed a treaty with the Aboriginal people of Port Phillip Bay – the Wurundjeri people – in 1835. As a result, the European colonisation of Victoria had already begun; however, it is thought that Major Mitchell’s findings rapidly sped-up the process. You can read more about the ‘Treaty’ of Batman here. 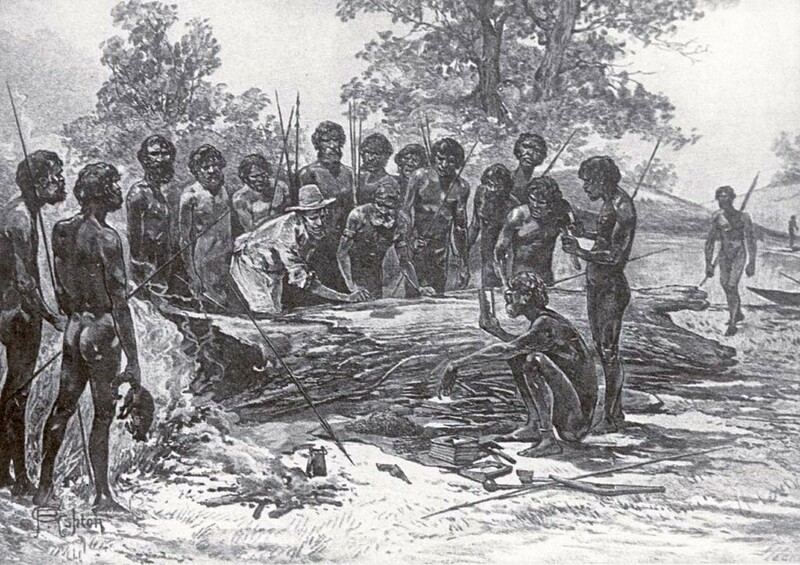 An artist’s impression of Batman’s Treaty with the Wurundjeri people in 1835 for the purchase of 600,000 acres of land. From Picturesque Atlas of Australasia, 2 vols, Picturesque Atlas Publishing Company, Sydney, 1886. (Vol 1, p161). Reproduced with permission from Wikipedia Commons. After 1835 and the arrival of thousands of European people, millions of sheep, instead of kangaroos, now fed on the grassy plains of Victoria. This new industry put Melbourne on the map as huge amounts of money were made by selling wool to the new factories in England. These sheep caused one of the most important foods for Victoria’s Aboriginal people – the murnong daisy – to nearly become extinct, and the European fences and guns caused a sudden end to the traditional way of life for the first people of this land. At least 69 massacres of Aboriginal people took place in the first 18 years of Victoria’s colonisation. The arrival of these European sheep farmers – called squatters – caused a sudden change to Victoria, but that change was nothing in comparison to that brought about by the Victorian gold rushes. The year 1851 is very significant in Victoria’s history. The Port Phillip District of New South Wales (Victoria’s colonial name before 1851) experienced a devastating series of fires in February called Black Thursday, thought by many to be the largest in known history. These fires killed 12 European people, 1 million sheep and countless native animals. In July, 1851, the Colony of Victoria was first established, named after the queen of the British Empire at this time – Queen Victoria. By August, gold had been found by European people, and newspapers all over the world spread the news – one of the world’s richest surface alluvial goldfields had been discovered in Ballarat (funnily enough at a place called Poverty Point, near to Sovereign Hill today). This new state, or ‘colony’ as it was known until Federation in 1901, would soon become the richest place in the world thanks to a few tonnes of shiny golden rock. That sudden wealth attracted another 500,000 people to the Colony of Victoria in just the first 10 years of the gold rushes (1851-61), which resulted in the speedy development of towns and trade. The 19th century Victorian gold rushes changed this part of the world in dramatic ways and, to this day, Victoria is still benefitting from its rich gold rush history (and, of course, the echoes of the Eureka Rebellion). Once all of the easy-to-collect surface gold had been taken, mines were dug deep underground. And when they stopped producing ‘payable’ gold, towns and cities created by the Victorian gold rushes either turned their wealth to manufacturing or disappeared. Today, Victoria has a population of a little over 6 million people (and more than 30,000 of these people identify as being of Aboriginal descent). While it is no longer the richest place in the world, it is still very wealthy, comfortable and safe because of its goldrush history. In the 21st century, Victoria’s most important industries are manufacturing, education, hospitality, tourism and construction, among others. Gold mining continues in Ballarat, although only one gold mine still operates.